I am starting off this weekend healthy. . . but not lacking in flavor. 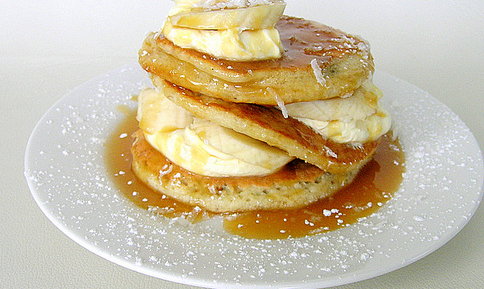 These delicious pancakes are the best around for grain-and-gluten-free recipes. They are so fluffy, you would never know they weren't made with white flour. Preheat griddle over medium-low heat. In a small bowl beat eggs until frothy, about two minutes. Mix in milk, vanilla, and honey. Grease pan with butter. Ladle a few tablespoons of batter into pan for each pancake. Spread out slightly with the back of a spoon. The pancakes should be 2-3 inches in diameter and fairly thick. Cook for a few minutes on each side, until the tops dry out slightly and the bottoms start to brown. Flip and cook an additional 2-3 minutes. Serve hot with butter, syrup, and/or fruit (I used bananas). Now I can feel good about indulging in some weekend pancakes!